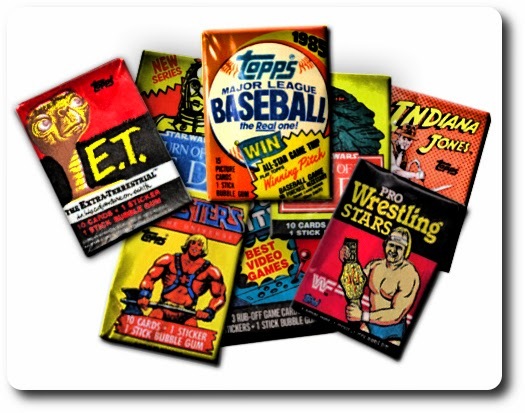 My childhood might as well have been a catalogue for Topps. I collected them all: baseball, movie, comic, video game... If a card set came out for it, I was buying it. It started innocently enough. My father bled navy blue pinstripes, and when he saw a buddy waving around a Reggie Jackson baseball card, he made it his mission to find out where they were sold. Turns out, they were sold in every corner candy store in NYC, and every newsstand. A dollar bought my dad 4 packs and a wife who questioned his sanity. My dad got off by blaming me. The baseball cards were for me. They were interesting and all, but I had no use for any players that were not on the New York Yankees roster. Unfortunately, scoring a member of the Bronx Bombers were few and far between. Enter: Steve, the boy next door. My friendship with Steve started over the backyard fence, trading baseball cards. He was willing to give me his extra Yankees, and I was willing to give him any card that was not a Yankees. We bonded over our love of baseball, 1966 Batman, Superman the movie, Star Wars, and Hulk Hogan. One day he came to my bedroom window, which faced his side yard, knocking like a madman. 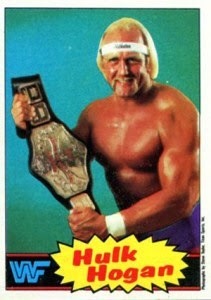 He had wrestling trading cards, and he scored a Hulk Hogan. Holy Cheezits! They have Hulk Hogan trading cards?! From that point on, Steve, who was 2 years older than me, and obviously well travelled in our neighborhood, and surrounding areas, became my card guru. He announced the latest and greatest cards out. He notified me and the rest of the kids on the block which store stocked which cards, and most importantly, when they restocked. Bringing the rest of the block's kids into this collective made the trading aspect of "Trading Cards" easier. Even so, I could never finish any set I started. I never had enough money on my own to buy packs as frequently as required, and by the time I did save enough to afford more, the stores had already moved on to the newest movie or pop culture set. Baseball cards, on the other hand were always kept in stock, so I usually had all summer to collect even if I never got close to completing one team. That's one reason I always went back to them year after year. That, and the fact that my dad would gladly fund my card habit if it involved baseball. My card collecting took another interesting turn the day Steve showed up with clear card sheets ranting and raving about "The Baseball Card Store!" Steve's basement flooded, which meant they couldn't use their washer. So, he told, they had to go to the laundromat, past Peter's Grocery, and Ace Tapes (our go to VHS rental place.) While at the laundromat, his mom gave him money to go make change since the machine there was broken. The candy store didn't have quarters and told him to check the store on the far corner. That store, was the fabled "Baseball Card Store." I made him promise to take me. The next week when they went to the laundromat, I asked my mom if I could go with them. She said sure, as long as I picked up a horror movie VHS from Ace Tapes on the way home. Once I walked into the store I was confused. I saw comic books everywhere. THIS was the "Baseball Card Store?!" Steve took me to the counter where there were several binders, and he opened one. They had cards in them, in those neat card sheets Steve showed me. My 10 year old mind was blown! The guy behind the counter explained it to us. We were allowed to look through the books, but we couldn't take any card out. Each card was priced. If we wanted one, we had to ask them for it. I picked out all the Yankees I needed, most costing a dime or a quarter. Then came the big three: Dave Winfield $1.25, Ricky Henderson $1.50, and Don Mattingly $2.00. I couldn't afford all three. But I could buy one and a pack of cards. I bought Winfield and a pack. I opened the pack immediately and got a Darryl Strawberry. He was a Mets. I didn't care how good a player he was. I hated the Mets. The guy behind the counter said he'd trade me the Strawberry for the Henderson and throw in 4 card sheets. I said yes! I should have asked for the Mattingly too, but I was scared to lose the Henderson. We moved from New York not too long after that. In fact, on the day we left, I took my dad to this store to show him the cards. I showed him the $2.00 Mattingly I needed to complete my 1986 Yankees team. He asked if I wanted it he'd buy it for me. I said no. It was too much. I regretted it before I even got into the Ryder truck. Two years later, while driving through Kissimmee, Fl, I saw a store boldly proclaiming "Baseball Cards." My dad and I went in to investigate. I had a second chance to get that Mattingly that haunted my dreams for those 2 long years. 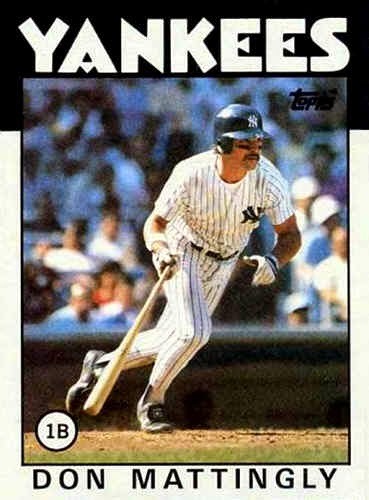 To this day, that 1986 Topps Mattingly, is my biggest childhood regret.